The DRFC reassembled today in Hanover after taking a brief break in the wake of winter term’s final exams. Returning to Corey Ford for the first time since the end of the fall, the DRFC gathered to go over the week’s schedule and to review the team’s strategy with the first round of the Varsity Cup less than two weeks away. After a quick breakfast, the team headed back to campus for the first of two sessions on Scully Fahey Field, the turf lacrosse field that will see the DRFC host New England College on Saturday, March 29th, St. Mary’s University on Tuesday, March 31st, and finally the U.S. Naval Academy on Saturday, April 4th in the first round of the Varsity Cup. The morning practice session focused on ball handling and getting back to basics, as the team competed against each other in various skill games in the sub-freezing temperatures. Convening back at Corey Ford for a film session of work-ons from the fall’s Ivy League season, the DRFC took a crash course in reviewing offensive structure with Coach James Willocks and then grabbed lunch before breaking up for a brief rest. Back on Scully Fahey for the afternoon practice and with temperatures rising slightly, the team jumped straight into the offensive pattern, with Coaches Hickie and Magleby as well as Head Trainer Ben Schuler posing a stiff defense. The team looked great, especially for the first day back, and all were excited to be outside running around again after a long winter indoors. The DRFC is excited to be back on campus and is excited to welcome back our teammates who participated in terms abroad and worked in internships this winter. There is an awesome group of players in attendance from the class of 2018, who put in great work all winter and who look to carry the DRFC’s strong tradition for years to come. 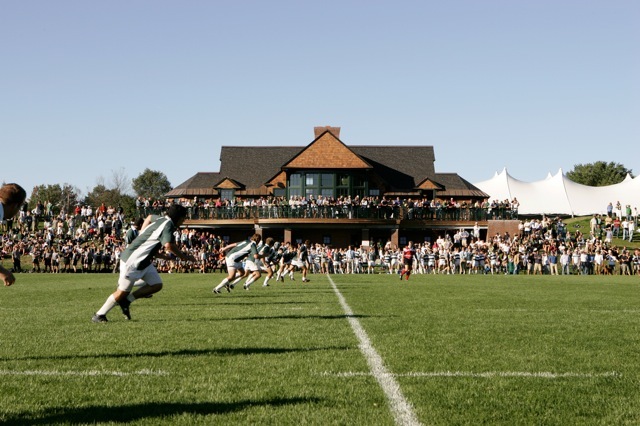 The team has a lot of work ahead, with double sessions galore and multiple games on the docket, but it believes that these weeks in Hanover will put us in the best position to succeed in our spring XVs and VIIs seasons. With the weather trending upwards and a thrilling set of fixtures in place, the DRFC’s Spring Training Camp is shaping up to be a competitive and hard fought affair. More than anything, the team would like to thank its loyal alumni and parent bases for their support and for putting us in the best position to win. We look forward to delivering on the work we will put in during this Camp and expect an exciting, successful spring season to follow. The DRFC would like to express our gratitude to all of our alums. We would particularly like to thank Nick Downer '11 and Chris Downer '11 for supporting our Spring Camp. The Downer twins starred in Dartmouth's first CRC Championship in 2011 and are now pursuing careers in finance, with Chris in London and Nick in San Diego.